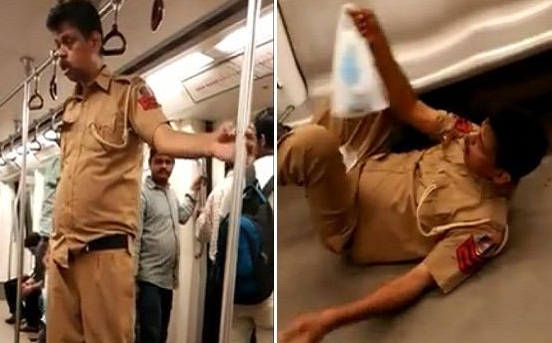 New Delhi: A video which is showing a policeman reportedly drunk on the Delhi metro had gone viral on Social media last year but that was not the truth he was actually ill not drunk. In the video a Delhi Police personnel in the Metro was staggering around in the coach appeared to be in a habitual drunkard state. The cop, Salim PK, who is a head constable with the Delhi Police wasn’t drunk at all but suffered a damage. The 50-year-old constable was made to face inquiry after the video went viral and then he got suspended. The report says, due to the black-out Salim PK looks staggering when he boarded the Metro. He, on the day on which the video was recorded, had difficulty in even locating the doors of the train. The cop, Salim PK was posted at the Civil Lines police station of Delhi, approached the Apex Court after getting a clean chit from the then Police Commissioner B S Bassi. After that his suspension was withdrawn and he was reinstated on November 5, 2015. Now, Salim is seeking compensation for the reckless uploading of the video and media coverage without verifying the fact which had “irreparably maligned his image in the eyes of the public”. As seen in the video he struggled to find his balance and crashed down to the floor. However, Now Salim has urged the government to take steps to remove the video.